"Buddha may have found enlightenment by simply sitting quietly under a bodhi tree, but journalist/wisdom seeker Dana Micucci describes herself as �a bit of an adventure addict� and, for her own circuitous path to nirvana, compiled a bucket list of seven of the world�s must-see spiritual hot spots for her signposts. 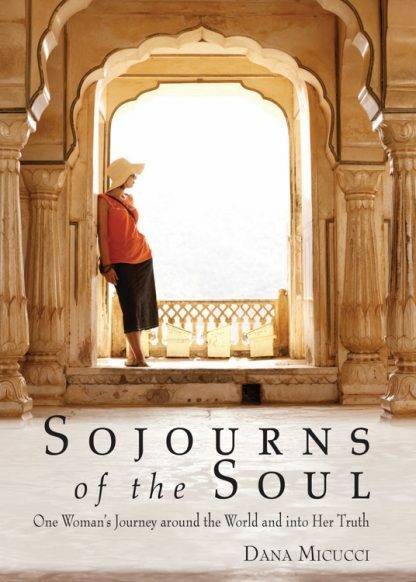 Sojourns of the Soul differs from other inspirational travel books by providing a rare mix of in-depth wisdom and literary insights from the holistic view of one experienced female traveler. Dana Micucci gives a compelling account of her growing spiritual illumination through visits to some of the most sacred places on earth. Her lively, engaging narrative takes us to seven sites in all: the Australian outback, Angkor in Cambodia, the Valley of the Kings in Egypt, Lhasa in Tibet, Chichen Itza in the Yucatan; the Monastery of Christ in the Desert in New Mexico, and Machu Picchu in Peru. Micucci links each visit with the awakening of a particular chakra- the chakras being the seven energy centers of the body associated in Hinduism with progressive enlightenment. In the afterword, she reflects on how her experiences continue to shape her life after resuming her career as a journalist in New York City: she finds she is more tolerant, can engage in daily activities with more heart-centered awareness, and can sustain states of joy and gratitude for longer periods of time. The book will be a page turner for readers who yearn for long-delayed adventure, with the added benefit that it is not just a journey log but more of a seeker�s manual; travel is simply the vehicle. Readers will find that they don�t have to travel to far-flung places for the spiritual inspiration available in their everyday lives. As Micucci says, �Each day brings new remembrances of our divinity, of the Divine presence in all beings, and of our eternal connection to each other. I am so grateful to be here NOW . . . with you. Dana Micucci's fascination with the written word began at a young age. An early obsession with children's story books led to juvenile attempts at penning prose and poetry, and eventually to a compulsive stalking of book stores. After received her BA and MA in English literature from Northwestern University, she indulged a long-held fantasy to live as a bohemian writer in a garret of her own on the Left Bank of Paris. Upon returning from Paris, she carved out a niche as a freelance journalist in New York and later found work as a senior publicist at Christie's, the international art auction house. Over the past twenty-five years, Micucci's articles and essays have appeared in newspapers and magazines such as The New York Times, International Herald Tribune, Chicago Tribune, Architectural Digest, Town & Country, Art & Antiques and Veranda, covering the topics of culture, art, design, travel and spiritual and social issues. Micucci has had the privilege of interviewing numerous noted figures, including His Highness the Aga Khan; architect Richard Meier; writers Toni Morrison, Doris Lessing and Erica Jong; choreographer Twyla Tharp; and artists such as Louise Bourgeois, Sean Scully and Kiki Smith. Her art-related travel stories have taken Micucci throughout the world, reaffirming for her that, as Henry James said, "one of the greatest joys in writing is having written." Her passion for fiction has led her to Columbia University's Creative Writing Program, where she was a senior writing fellow and studied with the late novelist Raymond Kennedy while publishing poetry in literary journals. In addition to her newest title, Micucci is the author of Artists in Residence (The Little Bookroom), a guide to the homes and studios of eight 19th-century artists in and around Paris; Best Bids: The Insider's Guide to Buying at Auction (Viking Studio/Penguin Books); and Collector's Journal (The Little Bookroom). In connection with her books, Micucci has been interviewed by radio and print media and has lectured on the arts at New York University and other organizations. She lives in Taos, NM.